I have run into a strange problem. 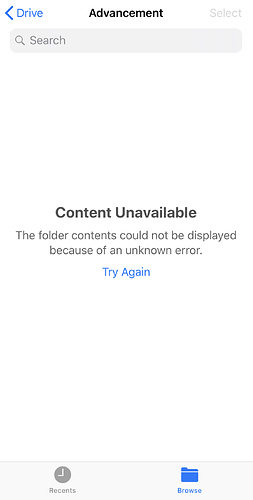 On my iPhone, and only on my iPhone, the contents of my Google Drive no longer show up in the Files application, it will periodically show folders but when I click on them there is no content and I get an error message. I have deactivated the drive and reactivated it, I have deleted the Files app and reinstalled the Files app, I have rebooted the phone, etc. But no matter what I do I keep coming across the same error. Does anyone have any idea what the source of this problem might be? I should add, the iCloud folders and files are all fine and I’m able to access all of the Google documents on my iPad and Mac in both the Files app and the Google Drive app. My guess is that it’s related to ad-blocking. I had a similar issue a while back, though not with a Google domain, and whitelisting the domain fixed the issue. Thanks for the suggestion. I’m not using a browser to access the files. I’m using the Apple Files app on the iPhone. It is a strange problem. Can you access your Google Drive files on the phone using the Google Drive app? Yes, I can access the files every way except through the File app. In the Files app try going to Browse > Locations and turn off Google Drive, quit the app, relaunch and turn the slider back on. I’ve done that several times to no avail. Seems you’re not the only one with this problem.